The Internet is full of horrible trolls! Like me. Launch some new product, and we'll flock to it in an attempt to make mischief. That's why Mike Monteiro's Dickproofing idea [link kinda nsfw-ish] is pure genius. I asked Mike to explain the concept to me on IM. Here's what he had to say. Mat: Dickproofing is genius, is it for real? 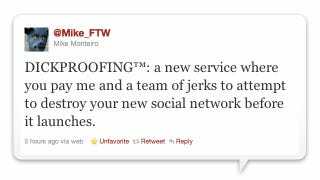 Mike: I don't think dickproofing can save a bad business model, that's not its intent, but it can certainly show you how your service will get messed with. And you might be ok with it being messed with, but you should be aware of HOW it might happen. And we're not talking malice. We're talking about the standard jerks who figure out how to use your service for Beavis and Butthead type hijinks. I don't think anyone set out to destroy Stamped. It's just that the bad kids got on it first. And instead of lots of stamps for "The Muppets" you've got stamps for "Getting Handjobs During the Muppets." And, for all I know, the people who made it are fine with that. Mat: Will dicks always use a new social service for Beavis and Butthead style hijinks? Mat: Like lying on Twitter? Mike: Exactly. Remember the first couple months of twitter? "I'm eating a sandwich." "I'm at macy's." Then the characters showed up. Mat: I think you're lying now.